When skin is affected by environmental assault (and everyone’s skin is) or you have signs of ageing, uneven skin tone, enlarged pores, and skin prone to bumps, retinol steps in and seems to intuitively know what your skin needs to minimise those concerns. Once retinol has been applied to skin, it goes to work helping skin normalise skin’s look and feel, working in tandem with other ingredients proven to visibly diminish numerous skin concerns. 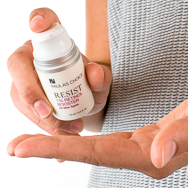 When you start using a product containing an appropriate amount of retinol for your skin type, along with daily use of a broad spectrum sunscreen rated SPF 30 or greater, you will love what starts happening to your skin! Sunscreen is always critical. Even the most effective, research-proven anti-ageing ingredients like retinol won’t work as you want them to if you’re not diligent about daily sun protection. It is also important to remember that even though vitamin A is a superstar anti-ageing ingredient for skin, one special ingredient is NEVER enough to take the best possible care of skin.